Dustin McCaslin flew a DJI Phantom 3 drone overhead of surfers Saturday morning. He initially thought that he had filmed seaweed between the surfers. While watching the footage, though, he realized he had filmed a shark. 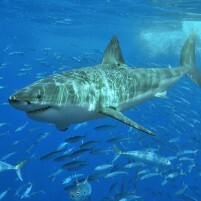 The shark was identified as a great white, approximately 10 feet in length. McCaslin took the footage to a lifeguard, who said that sharks are always out there, but people usually cannot see them. The surfers were unaware of the shark swimming beside them Saturday. It appeared a second shark joined the great white during the recording. I wonder what that surfer would think that had two of the sharks swimming by him LOL. It is one thing to know “in theory” that there are critters in the ocean; a whole other to know they are THAT close! The article suggest that the filming of the shark was purely accidental. The footage itself clearly shows that the drone operator deftly followed the shark for several minutes. Nicely done. What a treat! I love Marine Biology. The animals are doing what they do; they are swimming around, checking stuff out. Apparently humans don’t taste very good, we are gristly. It’s those sea lions and seals that have some nice layering of fat. That said, there were two sharks sort of close to the shore and close to the movement. My guess/hope is that they weren’t so hungry that they were lurking/studying to see if this was good food or just gross people. P.S. I want my own drone to fly around! They’re all over the place here on the central coast but particularly where pinnipeds congregate. It’s not if, but when, the next attack on a human occurs. When we enter the ocean we become part of the food chain and we’re no longer at the top of it. Always a good idea to heed that advice.